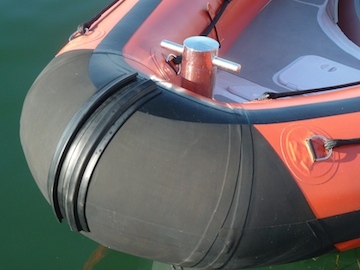 What do you get when you mate a rigid inflatable and a personal watercraft? Think Yamaha, and you might think about a fast, wet ride aboard a powerful jet-powered personal watercraft. 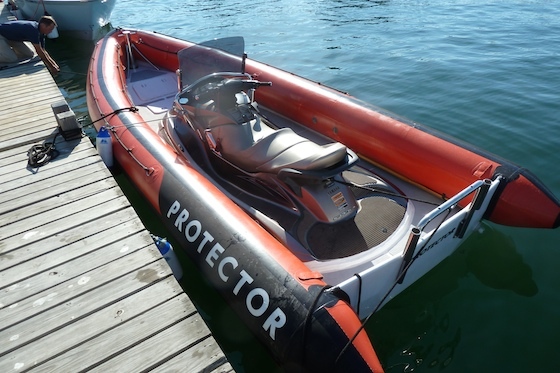 Think Protector and a lean, stylish rigid inflatable boat with premium performance and pricing probably comes to mind. Put them together and you have the latest take on a PWC-RIB hybrid, but different than any I’ve seen before. 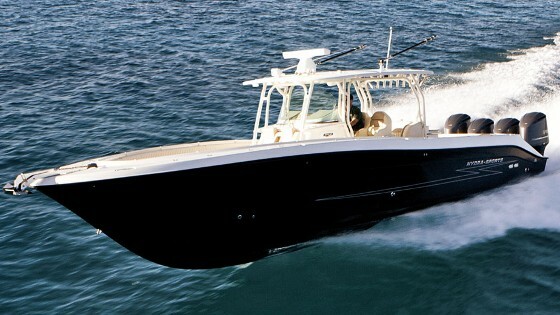 Instead of mating the PWC or its business end with the boat’s transom, the Protector Jet embraces the entire Yamaha FX Cruiser SHO in a molded cut-out in the middle of its cockpit deck. Yes, it seems odd at first look, but when I climbed aboard it began to seem perfectly normal. The Jet is humming along at 40-plus and there's no engine on the transom. The boats were first created last winter in New Zealand as a quick, efficient way for officials to follow the fleet at the Louis Vuitton Trophy sailing series. Umpires, in particular, need fast maneuverable craft to stay close to the larger sailboats. The experiment drew positive reviews, and the result, now, is a new Protector Jet model. 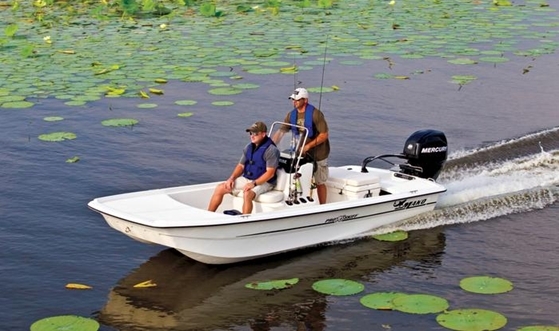 The Protector Jet fits a Yamaha PWC in the center section molded into its fiberglass hull. The boat's beam when fully inflated is 7'6" and all-up, the boat weighs 1,700 pounds. 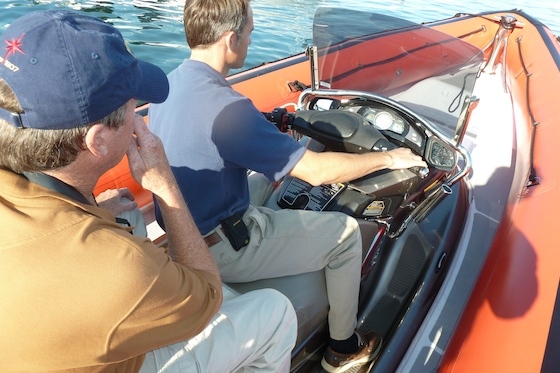 Andrew at the adjustable-tilt steering station of the Yamaha Waverunner, which has a supercharged four-cylinder, four-stroke engine with electronic fuel injection. 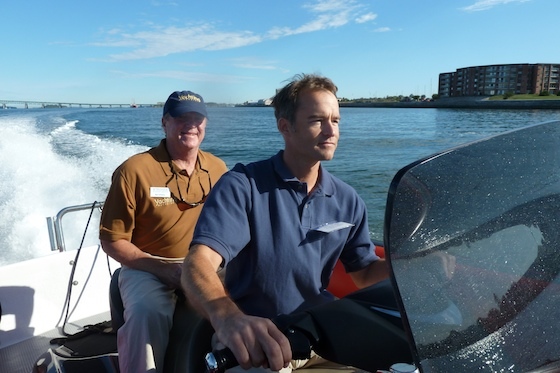 I rode one of two demos in the United States last month during the Newport International Boat Show (in Rhode Island). It was a quick ride and I didn’t drive, but I enjoyed the fast ride around Goat Island on a calm, clear day. 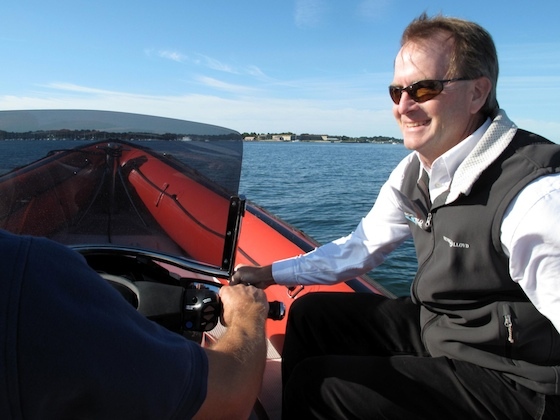 My colleague, Ben, rode on the passenger seat of the PWC (behind Andrew Carleton, of Protector USA); I perched on the inflatable side of the boat and hung on to the railing of the console, outboard of Andrew. Reinforced hypalon tubes are standard Protector quality. Conversation was easy as we idled out of the harbor, but not so much once we fired up to full speed. The distinctive high-pitched whine of the PWC engine is very different from an outboard, but equally loud. 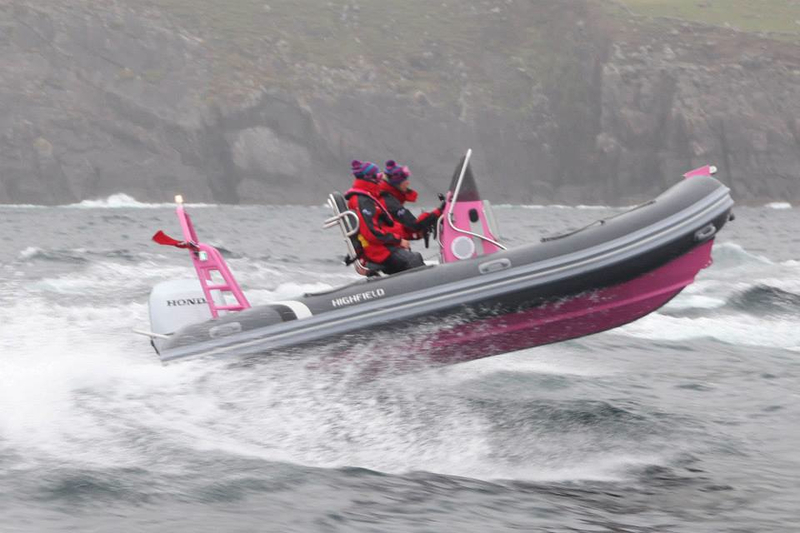 The boat accelerated rapidly and topped 40 miles per hour without difficulty. We’d tucked our hats away quickly, and I kept my face forward to keep my sunglasses on my face. We crossed a boat wake with a few bumps, but I’d say the Protector took it in stride. Ben took a photo of me and I can’t deny I had a big smile in place. And very quickly, we were entering the harbor from the other direction and our ride was winding down. First, the centerline seating of a PWC makes sense and, in fact, is normal on RIBs such as this. It looks pretty comfortable for a day of moving around at speed on a bouncy day. 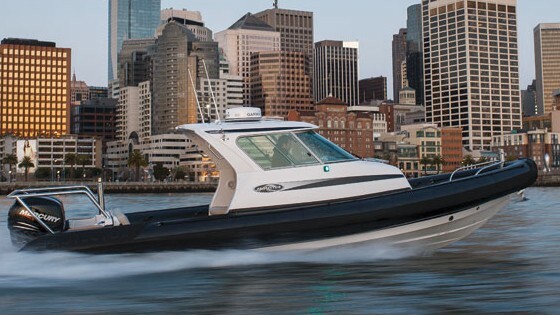 I expect an outboard-rigged version of this type of boat might have a slightly longer seat, creating a discrete third passenger seat, but then again, Ben invited me to ride behind him, and there was space. I just wasn’t sure I could take pictures or notes while hugging him. There's also an option for an aft seat for a couple more passengers. 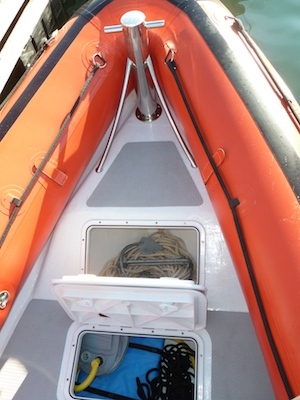 The Protector hull has several convenient storage compartments. 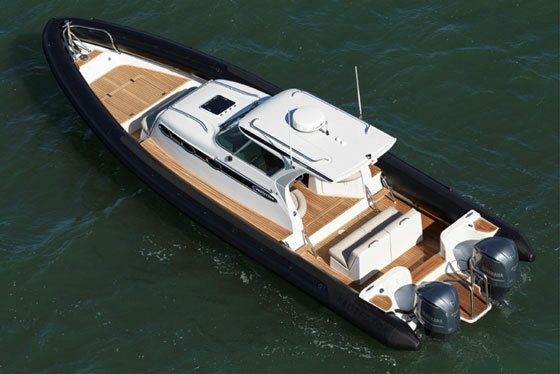 Second, the boat looks great (it comes in several colors) and seems well put together, which didn’t surprise me for a Protector. Also, it seemed plenty fast for a 20-footer. 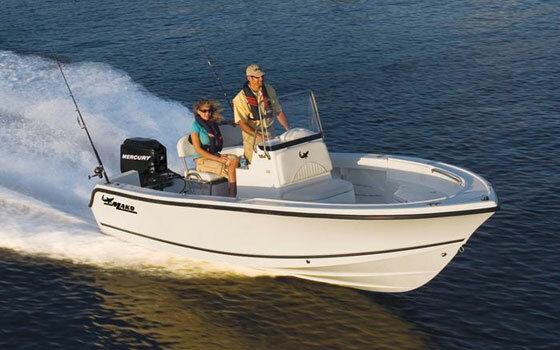 I think this would be an extremely versatile recreational craft for a variety of watersports, especially any that required shoal-water operation or safe maneuvering around people in the water. Third, I think the boat would be a lot of fun to drive, to ride, to hang out in. 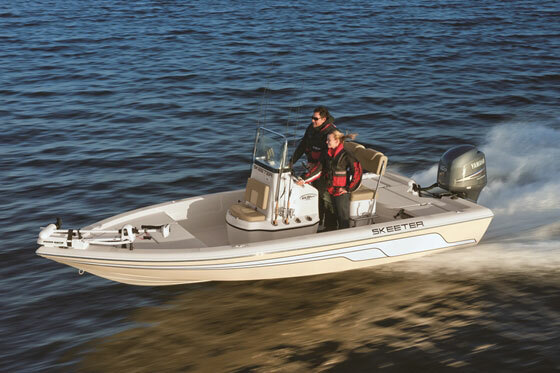 While it’s introductory price is $49,750 and it may be slightly on the premium side, it’s similar to that of a high-quality high-performance RIB with a four-stroke engine. If you buy one of these, just prepare yourself for a few phone calls: Every time a big sailing regatta comes to town, every umpire, sailing coach, race-committee mark puller, and Opti parent in your contacts file will be calling to borrow your Jet for the weekend. We’ll see what the market decides about Protector's new hybrid. Ten more are scheduled to arrive in the States from New Zealand before the end of the year and will be available for delivery in early 2011, either in Florida or elsewhere.